I am joined by the sensational guitarist, Chelsea Constable. Chelsea started making a huge name for herself via her popular YouTube channel with lessons and covers of many of our fav guitar heroes, including of course, Eddie Van Halen. It also didn’t hurt meeting & getting incredible advice from the legendary Les Paul himself at a very young age. She’s performed with a who’s who list of the world’s greatest players and continues to earn their respect. Endorsing some major brands such as Suhr guitars, TC Electronic, Taylor guitars and more. 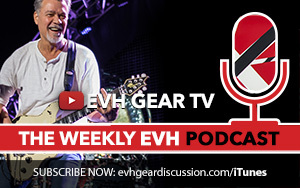 Tonight we’ll start with how I discovered Chelsea with her Eruption lesson, some fun Van Halen discussion and learn all we can with her valuable guitar insight.